The U.S. Constitution never explicitly mentions God or the divine, but the same cannot be said of the nation’s state constitutions. 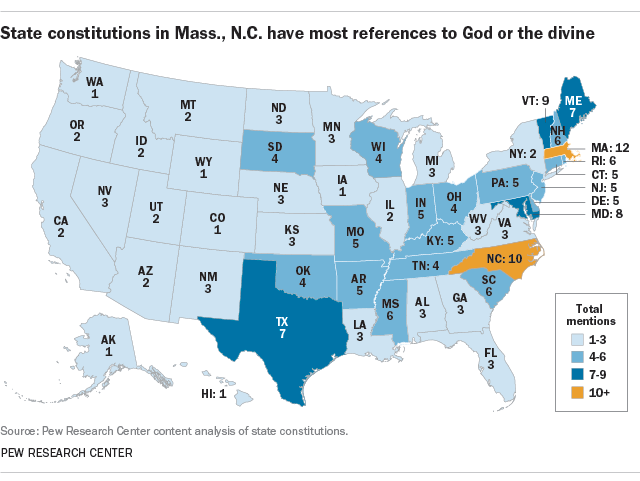 In fact, God or the divine is mentioned at least once in each of the 50 state constitutions and nearly 200 times overall, according to a Pew Research Center analysis. Most state constitutions – 34 – refer to God more than once. Of the 116 times the word appears in state constitutions, eight are in the Massachusetts constitution, and New Hampshire and Vermont have six references each. Perhaps surprisingly, all three of these states are among the least religious in the country, according to a 2016 Pew Research Center analysis. A handful of state constitutions explicitly prohibit those who do not believe in God from holding public office. However, these bans have not recently been enforced because it is generally assumed that they violate the U.S. Constitution’s prohibition on requiring religious tests for those holding public office.